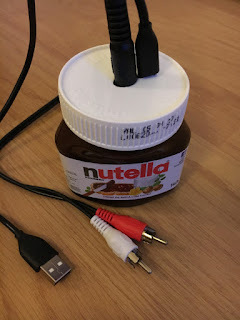 Getting the Nutella container to be empty is the easy part. Getting a CHIP delivered to your door however is another story. Mine has been ordered ages ago and still shows no sign of life. Have you tested system suspend & resume with that bluetooth speaker? Or does it not behave like the typical off-the-shelf speaker? @bestouff: it's June delivery if you ordered any accessories with it. The board I used in this is an early development board which I received as I work on the Wi-Fi driver that's used in that machine. @Jeff: system suspend? The device's power is yanked out when the amp switches off. I should probably add a little battery to make it suspend cleanly instead, but that's not on the cards yet. See the github repo for the list of known bugs. @Jeff: Never tested from another computer, just from phones.